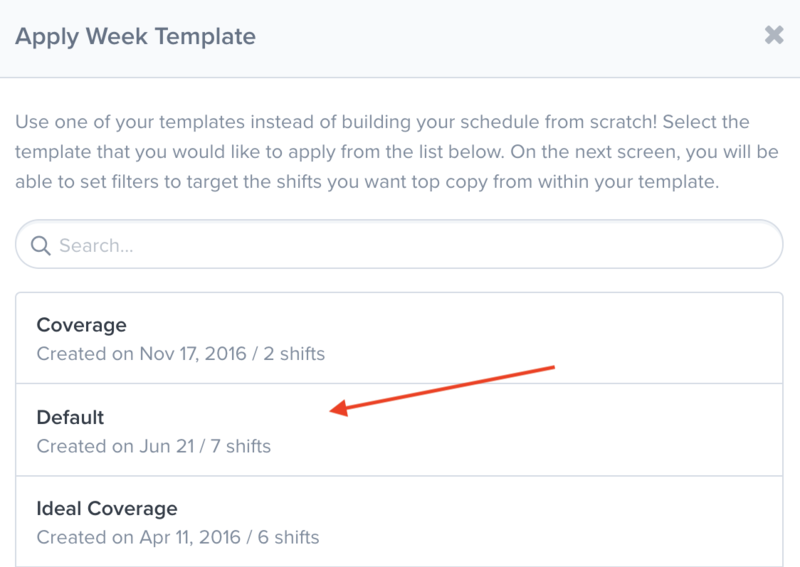 The best way to schedule faster with ZoomShift is to copy schedules from week to week. Once you know how to copy schedules, you will be scheduling in minutes. Copy shifts from another week or day. This article covers both methods. Note: Schedule templates and copying actions are only available from the Day and Week views. First, select the week or day you would like to save as a template using the date selector. Next, click on the Copy drop-down. 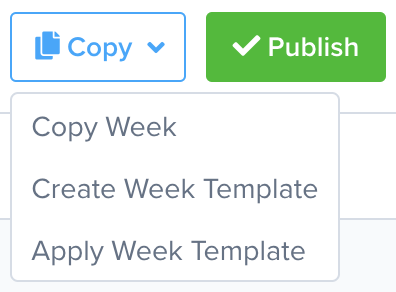 Then click Create Week (or Day) Template. Name Use this field to name your template. You can find schedule templates by name and apply them to any week or day. Description The description field is used to provide more information about the template. Filter Shifts Target shifts to save in the template. By default, any filters you have set will be selected. Once you submit the form, you can apply the template to the schedule. 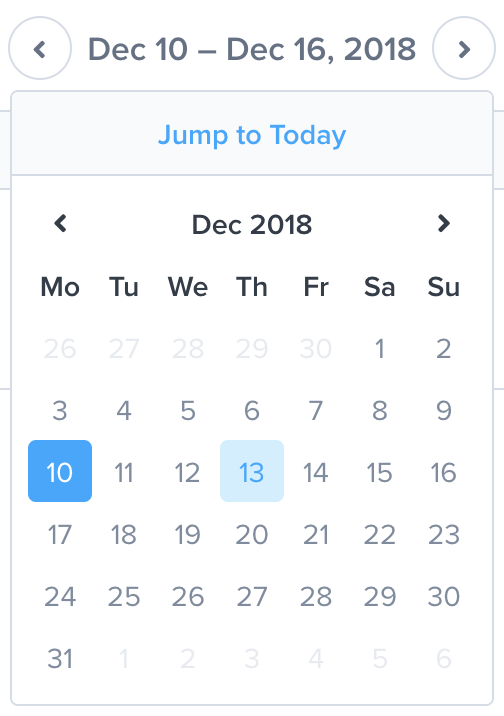 To apply a schedule template, select the day or week you would like to load the template to using the date selector. Click on the Copy drop-down. Then click Apply Week (or Day) Template. You should see a pop-out like the one below. Find and click on your template. 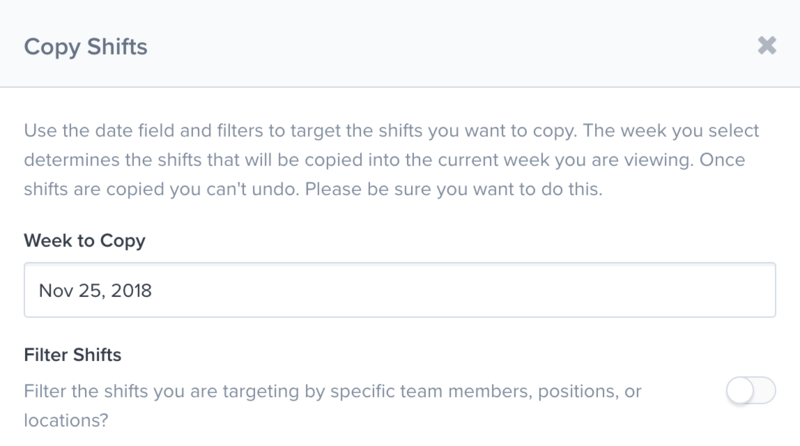 Next, filter the shifts that you want to copy to the schedule. 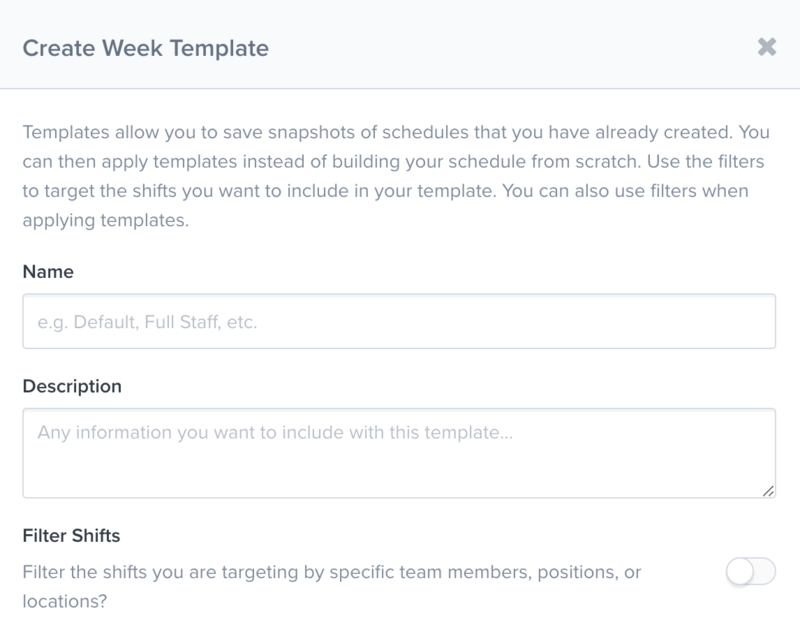 Once you submit the form, the shifts from your template will be copied to the schedule. Delete a schedule template by clicking on the Copy drop-down. Then click Apply Week (or Day) Template. Find the template in the pop-out and click on it. Then click the Delete button. Copying schedules week to week is a great alternative to templates. You can copy schedules from any week (past or future). To copy shifts from another day or week, select the week or day you would like to copy a schedule to using the date selector. Click on the Copy drop-down and click Copy Week (or Day). You should see a pop-out like the one below. Next, make sure you are copying the correct day or week, edit filters, and submit the form.